A very nice sandy beach on Capo Teulada behind Teulada marina, with a small offshore island. A breathtaking view all along the cliff-lined coast to Capo Malfatano. Parking, bar and rubber dinghy rental in high season. 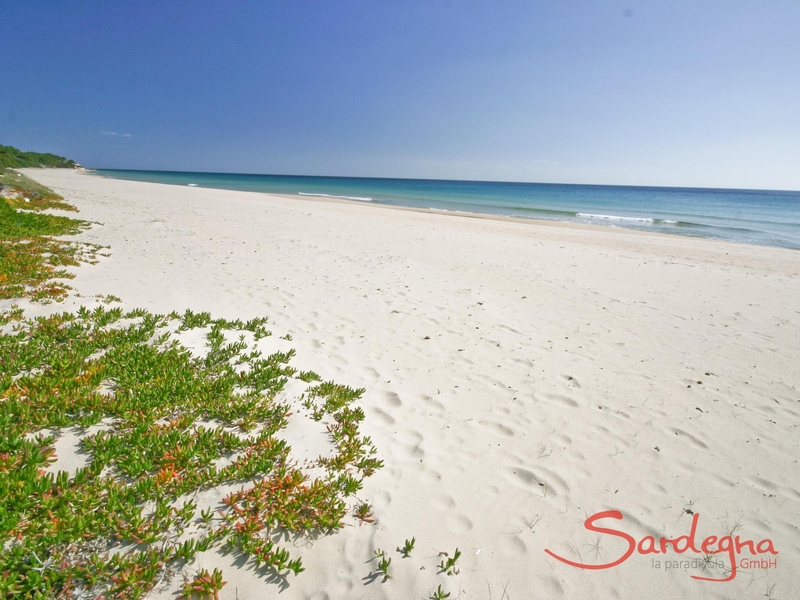 Relax and fish in the crystal clear sea in the south of Sardinia. In the port of Teulada, the boat Lucia Madre welcomes you on board to spend an unforgettable day. 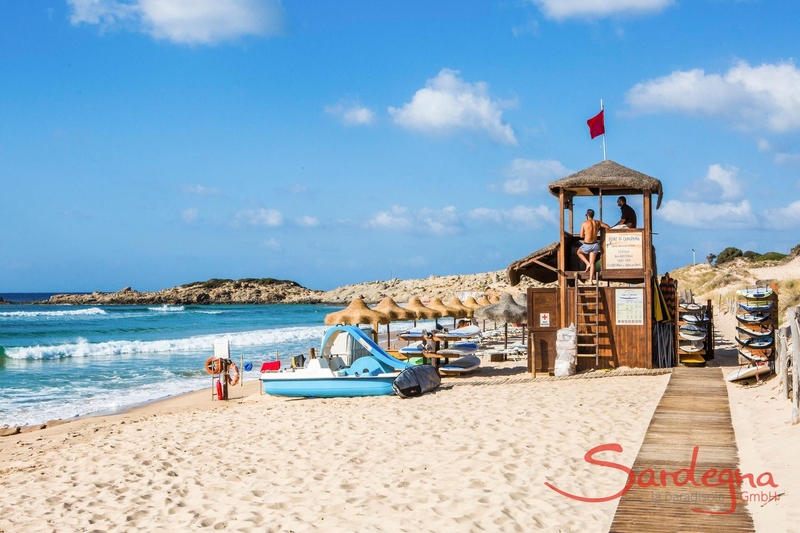 The tour is suitable for all ages and goes to beaches like Cala Zafferano and Cala Teulada, beautiful and completely untouched areas, where you can also go ashore and cool down in the refreshing water. For lunch the fresh catch of the day is served. 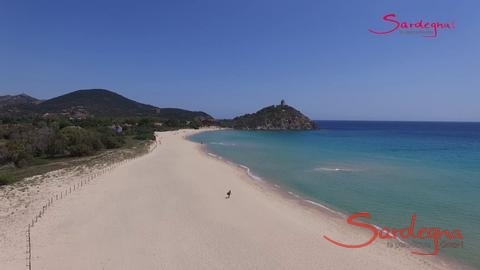 Go and discover the most beautiful and inaccessible coves and beaches of south Sardinia. Twenty-five boats are at your disposal to visit the unspoilt coast of Cape Teulada or alternatively the more famous beaches of Chia. Wide range of rubber dinghies from 4,30 m to 6 m can be operated without the need of a licence. They have a fiberglass rigid bottom, central console, electric start, and they carry a maximum of 10 people. Here you can also charter a catamaran "Lavezzi 40" or a sailboat "Gib'sea". Best fresh fish served in beautiful surroundings. From the sea you can only see the green lawn. Closed on Mondays. The sunny Villa Fernando is located in a luxurious holiday area along the beach next to the Villa Massidda, on a tranquil garden property. Only the garden gate separates the villa complex from the white sands. This exclusive coastal area remains in perfect natural form, and is used almost solely by the occupants of the private houses in the area. The spacious property is perfectly designed to allow every guest to enjoy his or her holiday in peace. Directly behind the stylish houses is a green pine forest, which provides shade to parts of the garden. The town of Pula is in close proximity, as well as riding stalls, golfing opportunities and water sport activities. The bright Villa Fernando extends over three floors: souterrain, first and second floor. The Mediterranean decoration and comfortable wooden furnitureround up the feeling of a beach home. Simply looking at the pictures of this vacation residence is enough to trigger the longing to hear the low rumble of the waves in the evening or to awaken to the brilliant sparkling sea in the morning. The twitter of birds from the pine forests complements the natural acoustics in this holiday home. 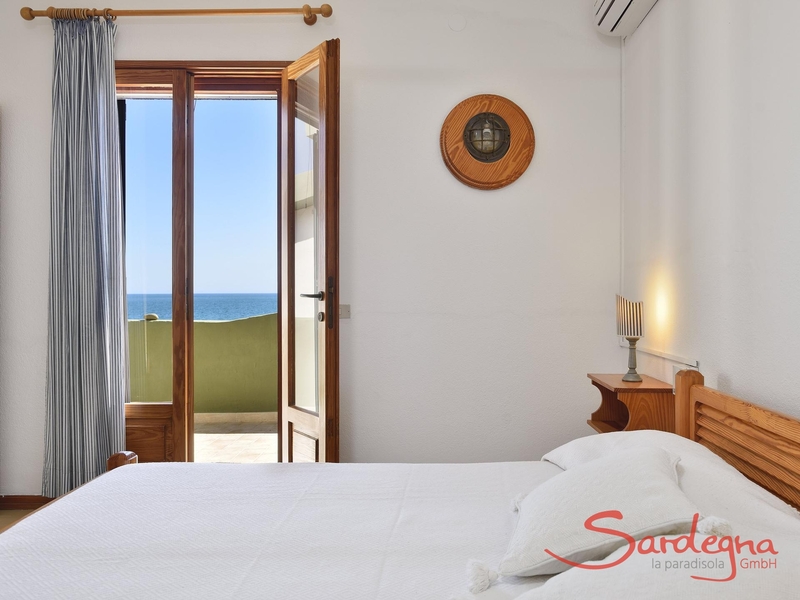 The villa offers four bedrooms, three with garden or sea views, as well as a balcony and three bathrooms. These rooms all have classic double beds, two of them can be seperated if needed. One small room in the basement contains a double bed (upon demand it is possible to seperate the bed in two single beds). Guests can gaze from the comfort of the top-floor living room down upon the wide sea. The kitchen in the elevated basement connects to the dining area and an open fireplace helps to create an atmosphere of comfort within the space. An additional fireplace is located in the top-floor living room. The area behind the house is especially luxurious. Whilst sitting on the covered terrace, guests can take in the bounteous garden and pine forest, all the while remaining in the shade. Reclining on the rattan chairs and couches in the exclusive garden pavilion, which is open on the sides, is sure to bring hours of relaxation and enjoyment. The barbeque area beckons to be used – what would a Sardinian vacation be without an evening spent grilling outdoors? The lawn in the front yard is separated from the beach only by a hedge, so it is just a few steps before guests can enjoy the lovely fine beach sands. A romantic end to a perfect day at the beach can be found strolling around the well-tended beach grounds, or watching the moon shimmer upon the sea from the comfort of the balcony above. When travelling with a group of friends or a larger family, this property is available for rent in combination with Villa Massidda, offering eight additional spaces. A decorative bamboo fence separates the two properties. A small supermarket for quick shopping trips is reachable by car in just a few minutes. The nearby town of Pula offers a great selection of shopping possibilities, even the opportunity to buy your wares directly from the farmer himself. There you will find boutiques, plazas and churches for your shopping and sightseeing pleasure. A plaza with a church and an ancient stone wall invite a day of strolling. A major cultural attraction in the area is excavation site of the ancient Roman city of Nora, which was founded in 900 B.C. South of Pula, the white sandy beaches of Chia, with dunes covered in juniper bushes, and clear Caribbean-like waters beckon for a visit. Sporting opportunities are ample in this area, including golfing at Is Molas, horse riding excursions, and boat rental from the private yacht club of Cala Verde. For sailors and surfers, the winds at Chia provide an excellent opportunity for adventure. A beach villa with a garden pavilionThe sunny Villa Fernando is located in a luxurious holiday area along the beach next to the Villa Massidda, on a tranquil garden property. Only the garden gate separates the villa complex from the white sands. This exclusive coastal area remains in perfect natural form, and is used almost solely by the occupants of the private houses in the area. The spacious property is perfectly designed to allow every guest to enjoy his or her holiday in peace. Directly behind the stylish houses is a green pine forest, which provides shade to parts of the garden. The town of Pula is in close proximity, as well as riding stalls, golfing opportunities and water sport activities.The Mediterranean dream of a home on the beachThe bright Villa Fernando extends over three floors: souterrain, first and second floor. 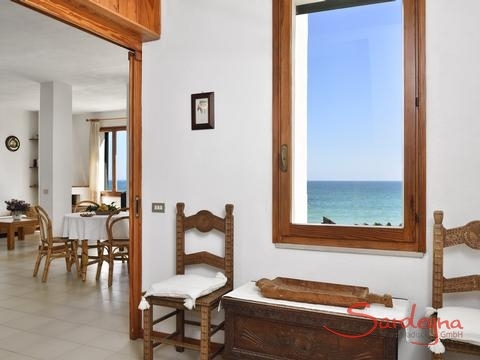 The Mediterranean decoration and comfortable wooden furnitureround up the feeling of a beach home. 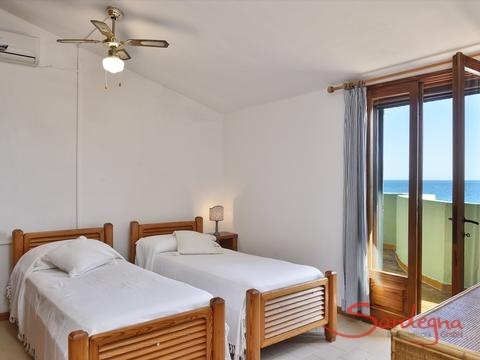 Simply looking at the pictures of this vacation residence is enough to trigger the longing to hear the low rumble of the waves in the evening or to awaken to the brilliant sparkling sea in the morning. The twitter of birds from the pine forests complements the natural acoustics in this holiday home. The villa offers four bedrooms, three with garden or sea views, as well as a balcony and three bathrooms. These rooms all have classic double beds, two of them can be seperated if needed. One small room in the basement contains a double bed (upon demand it is possible to seperate the bed in two single beds).Guests can gaze from the comfort of the top-floor living room down upon the wide sea. The kitchen in the elevated basement connects to the dining area and an open fireplace helps to create an atmosphere of comfort within the space. An additional fireplace is located in the top-floor living room. The area behind the house is especially luxurious. Whilst sitting on the covered terrace, guests can take in the bounteous garden and pine forest, all the while remaining in the shade. Reclining on the rattan chairs and couches in the exclusive garden pavilion, which is open on the sides, is sure to bring hours of relaxation and enjoyment. 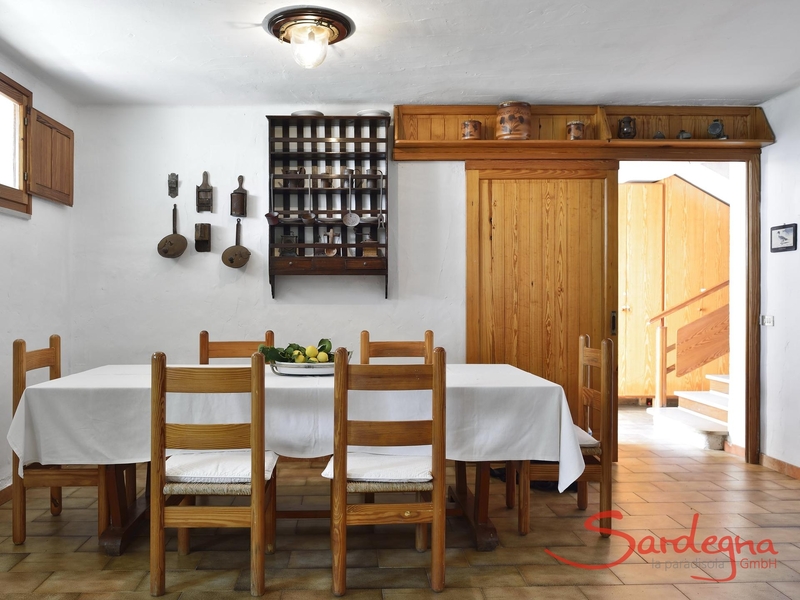 The barbeque area beckons to be used – what would a Sardinian vacation be without an evening spent grilling outdoors? 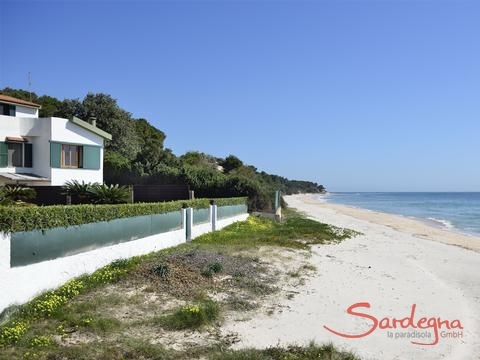 The lawn in the front yard is separated from the beach only by a hedge, so it is just a few steps before guests can enjoy the lovely fine beach sands. A romantic end to a perfect day at the beach can be found strolling around the well-tended beach grounds, or watching the moon shimmer upon the sea from the comfort of the balcony above.When travelling with a group of friends or a larger family, this property is available for rent in combination with Villa Massidda, offering eight additional spaces. A decorative bamboo fence separates the two properties.Within the areaA small supermarket for quick shopping trips is reachable by car in just a few minutes. 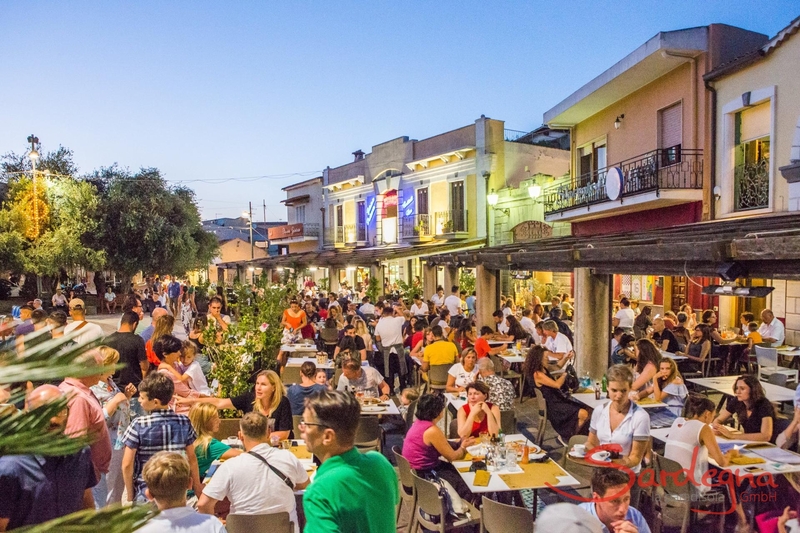 The nearby town of Pula offers a great selection of shopping possibilities, even the opportunity to buy your wares directly from the farmer himself. There you will find boutiques, plazas and churches for your shopping and sightseeing pleasure. A plaza with a church and an ancient stone wall invite a day of strolling. A major cultural attraction in the area is excavation site of the ancient Roman city of Nora, which was founded in 900 B.C. 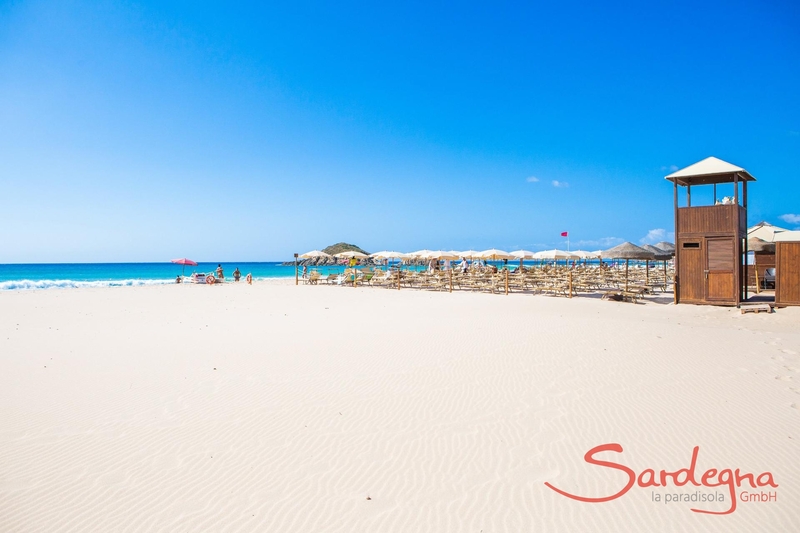 South of Pula, the white sandy beaches of Chia, with dunes covered in juniper bushes, and clear Caribbean-like waters beckon for a visit. Sporting opportunities are ample in this area, including golfing at Is Molas, horse riding excursions, and boat rental from the private yacht club of Cala Verde. For sailors and surfers, the winds at Chia provide an excellent opportunity for adventure. Villa Massidda is a beach-facing, light-filled holiday home over two floors. 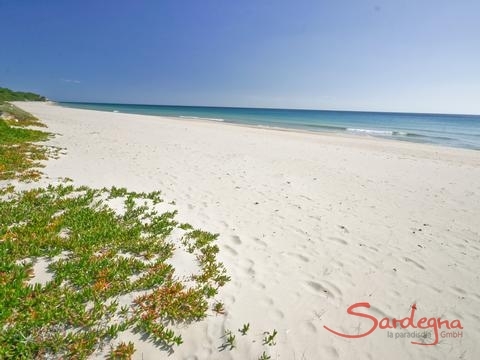 Its location is simply breath-taking - right on the beach of a luxurious residential area. Peace and bathing fun are guaranteed. A pine forest rises behind the house. 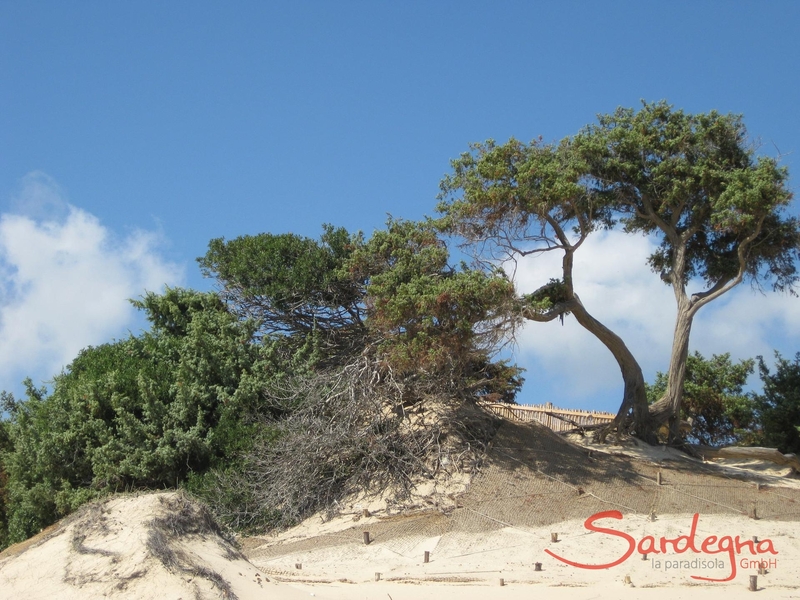 Experience Sardinia in a new way! 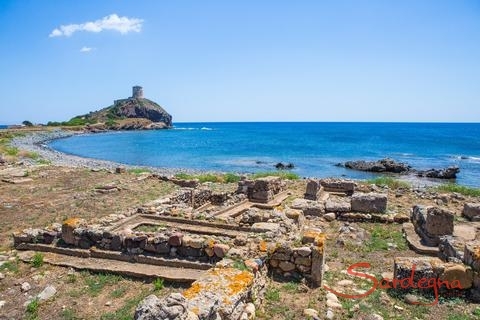 Villa Pola is a fantastic holiday villa with a pool and a large garden in the southwest of Sardinia - only 100 metres from the stunning sandy beach. The fragrance of pine trees, exotic flowers and the nearby sea will beguile you. And the Is Molas golf course is very close by. Book now!